You are here: Home > This Summer, Get Outdoors! Take a hike on your favorite trail or try a new one! 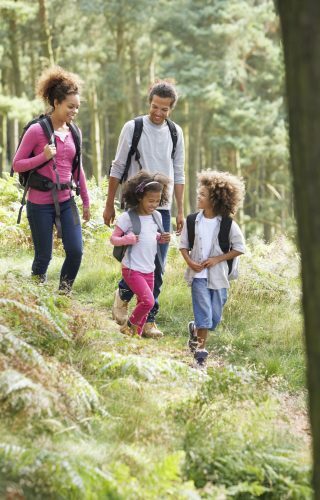 Hiking can be an easy, budget friendly activity for the whole family. You can find a trail that is family friendly and fits your level. Check out some of these awesome Orange County Park Trails from the Irvine Ranch Natural Landmarks. Bring the family along for a bike ride at the park or in your neighborhood. Biking is a fun way to get more active with your family. Find a new route today using the bikeways map from OCTA. Escape the indoors and go camping at your local park, state park, or national park. Can’t go too far? You can even camp in your backyard! Camping can be a great little adventure away from home to relax and explore the outdoors. View the OC Parks Interactive Parks Map to find a local park campsite near you. Take your family to a local park and enjoy different activities like soccer or basketball. Playing outside can be a great way to be more physically active while having fun with the entire family. Many Orange County parks have different types of activities to enjoy like playgrounds and sport courts. View the OC Parks Interactive Parks Map to find a playground or sports court near you. Try one of these outdoor activities with your family this summer. It is a great way to take a relaxing break from your busy schedule and spend quality time with your loved ones. Get outdoors!